Over the past two years, LG has taken the stage at the annual CES show in Las Vegas to unveil the curvy G Flex and G Flex 2. But with CES 2016 only a few weeks away, we've heard near nothing about the expected LG G Flex 3 so far - and, reportedly, we might not hear anything at all, ever. Not only is the G Flex 3 reportedly going to be a CES no-show, but according to Korean news site Media Daum, LG might scrap the curved phone all together. Or course, this is just a rumor at this point, but it would be a shame if LG decided to leave the G Flex 3 - or any phone - at home as there's been a dearth of smartphones at the annual show. 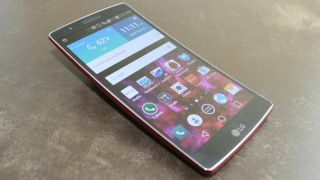 At CES 2015, the G Flex 2 was the only new handset announced by a major firm, thus grabbing plenty of the spotlight. While we have no word as to why LG may shelve the next G Flex, the other handsets, though novel, didn't exactly set any sales records. It could be LG wants to focus on devices that can compete directly with the likes of the Galaxy S6 and iPhone 6S rather than phones with short-lived novelty appeal. Meanwhile, the report does say the anticipated LG G5 will be be unveiled in April of next year, while a successor to the LG V10 is expect to launch in the second have of 2016. If the new report proves true, it would mean the next LG phone to land will be the LG G5, which is expected to sport a Snapdragon 820 CPU, Adreno 530 GPU and a 5.6-inch 2K display, along with a bumped up 21MP camera. Interestingly, more recent rumors suggest the LG G5 might also come with an iris scanner and, at the very least, an finger scanner for unlocking the handset.